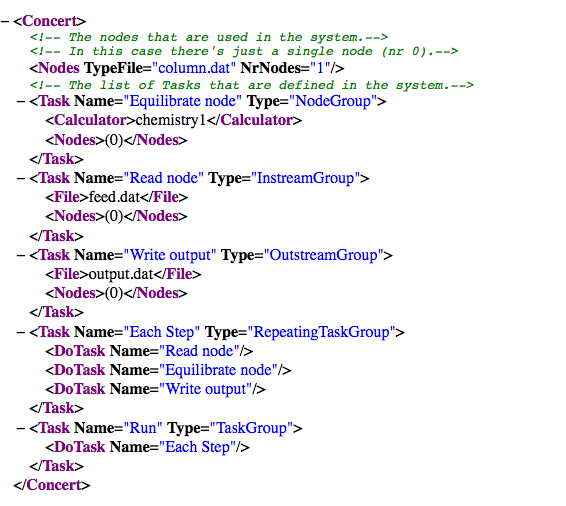 ORCHESTRA model systems are defined in text files. 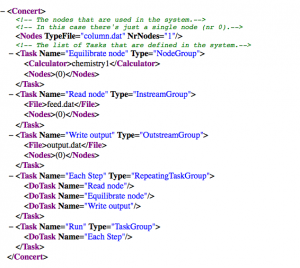 The central input file is the CONCERT.xml which contains the complete model calculation recipe in terms of cells, input files, output files, calculators, connections between cells etc. and writes results to “output.dat”. The actual equilibrium calculations are defined within the chemistry1.inp file. As defined here this model will require 4 other input files: column.dat, chemistry1.inp, feed.dat and output.dat. The complete syntax of ORCHESTRA concert file definitions can be found here.